We recently released a new way for you to post to your social media accounts. This new feature is called Auto Post. It was developed to help you get the most out of your social media posts, while spending less time actually scheduling them. These statistics show that in order to reach your entire audience, you have to share content more than once. Before you go and hire another social media manager to help you increase your posting frequency or give up on social media altogether, consider using our auto-scheduler. With Auto Post, content does not go to waste after the first time it is posted. In fact, your content is saved forever, or until you delete it. Even better, all you have to do is upload it once and it will begin automatically posting based on your pre-set weekly schedule. Once all new content in your queue is posted, our auto-scheduler will re-share your posts again. This allows your posts to be seen by a larger audience and is perfect for evergreen content. In additional to declining organic reach, another major pain-point for social media marketers is how time-consuming finding new content is. With Auto-Post, the need to constantly find and schedule content is greatly decreased, giving you more time to focus on engaging and growing your business. How Does Auto Post Help Your Business? Auto Post exactly what you want, when you want it! How often do you share promotional posts? How often do you share quotes? Most businesses have no idea or could only give you an estimate. Not knowing can result in your business sharing too much of one type of content, which will drive away followers. With Auto Post Queues, you can easily organize your content and control precisely how often each type of content is shared. Queues are groups of posts that will be shared in the order they were uploaded and based on your pre-set schedule. If you want to share a promotional post 3 times a week, simply schedule your promotional queue to post 3 times per week. Then all you have to do is continue to add new promotional posts to this queue and Auto Post will handle the rest. It is imperative that you take control of your social media posting strategy. Auto Post Queues simplify the process of organizing and distributing your content, boosting engagement and reach along the way. By setting an end date for a queue, you can easily turn it into an automated campaign. Simply add the content you would like to share and add an end date. We will automatically post your content based on your schedule and will stop it once the time-frame is over. You can easily add and remove content from you queue as you go, as well as change your scheduling frequency to post more or less. Have an upcoming event or product launch? Create a queue for content specifically for it and watch as Auto Post begins promoting it for you. Once the campaign is completed, analyze how effective it was in our Post Analytics. A-B testing is the process of trying several different messages and styles in order to figure out what resonates best with your audience. Auto Post makes A-B testing easier to organize and analyze. Simply create multiple queues for your different formats and see which one does better. We have used Auto Post to test different titles, formats, etc. and have seen a major increase in engagement. The best part is that your content is organized, so finding, editing and deleting content is fast and easy. 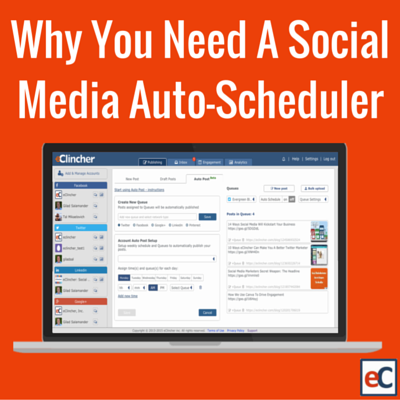 Interested in trying out our auto scheduler? Test it out for 14 days for free. Also, be sure to read our recent blog post about how to get started with Auto Post to learn more in more detail how it works.